The First Four Sea Restaurant opened its door in Hacienda Heights, California back in 2002. Today, the restaurant now has 4 locations throughout Southern California (San Gabriel, Arcadia, Irvine and Hacienda Heights). Four Sea Restaurant is a traditional Chinese-Taiwanese deli that serves breakfast menu similar to those that are found historically in China and Taiwan. The soybean drinks are one of the most popular beverages on Four Sea’s menu. Each day, the restaurant grinds up soy beans in preparation for the following day in order to provide fresh soy milk for their customers. Four Sea’s also gives out their ground soy bean as fertilization to all those who would like to take some home. Four Sea had previously commissioned us to develop an informational website for their business . 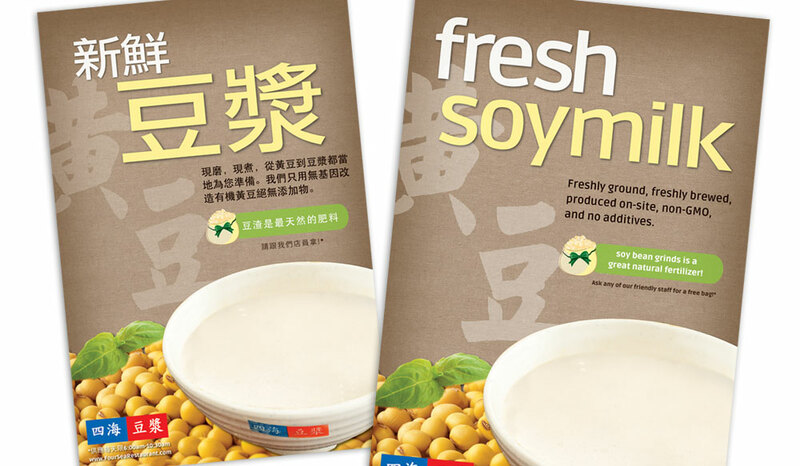 The client was greatly satisfied with the previous project and work and so they came back to commission us for this poster design project which promotes their freshly ground soy beans for their soy milk. This project was quite challenging because there were limitations to stock images available that represented the client well. After several discussions, to help reflect the freshness of the soy beans on the poster, our designers decided to use warm colors with a background of brown burlap (burlap is the material they used to package their ground soy bean), giving it an organic feel. Ready Artwork was able to come up with the solution to professionally photoshop and photo manipulate the soy beans for the poster artwork. The poster’s colors were mainly yellow and white to represent the bright and neutral colors of their beans.